The Cayman is known as the member of the Porsche family that bridges the gap between the Boxster S and the 911 Carrera. 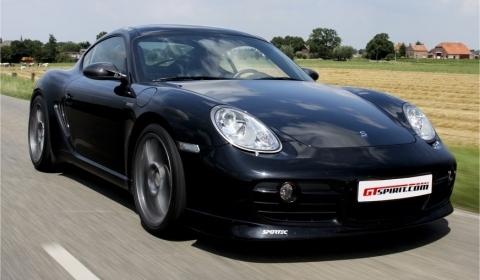 To get a proper GTspirit experience we didn’t use a standard version for our test, but the Sportec Cayman SP 380 with its stage 2 engine conversion to 3.8 liter and performance enhancements. The outcome of our road test gave us insight into Sportec’s philosophy and their program for the Cayman (S). 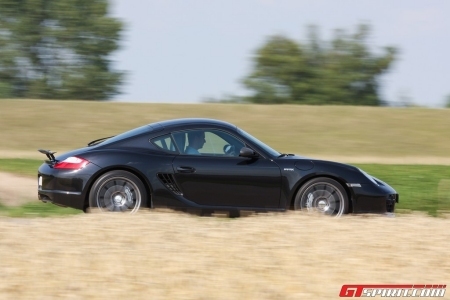 Built in both Zuffenhausen and Finland the 987 Cayman has been around for some years now. Upgrades have been delivered over the past four years, the appearance of Direct Fuel Injection and the PDK – Porsche’s Double Clutch – transmission are two examples the immediately spring to our minds. 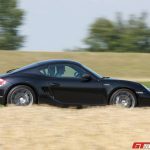 Two versions are available; the Cayman and Cayman S. So what are the differences between the two? Exhaust system, wheels, color of brake calipers and engine. The 3.4-liter flat-6 in the ‘S’ produces 40kw (55hp) and 70Nm of torque more than its little brother using a 2.9-liter engine. A sprint from 0 to 100km/h is done in 5,2 seconds, 0,6 seconds faster than the ‘normal’ version. To finalize the ‘S’-setup bigger 18-inch wheels are installed, Porsche Ceramic Composite Brake (PCCB) is available as an option, body parts are coloured in the main body color and the designation on the rear differs. First of all let’s check out the looks of the Cayman (S). It is a bit like a mix between the Boxster and its bigger brother, the 911 Carrera. The Cayman shares many components with its roofless brother, such as the front fenders, trunk lid, side doors, headlights and forward portion of the interior. However well balanced, it is more than just a hard-top version of the Boxster. The Cayman has an extra level of sportiness that the roadster misses. The mid-engined car has a tailgate allowing access to the rear luggage area, which is split into two levels by a stainless steel strip. Sportec added some refinements to the body work of the black metallic vehicle on display. 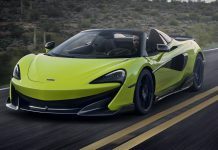 The full list includes a new front spoiler lip in black (also available in carbon), a set of air intakes in carbon “gloss” (also available in matte carbon), a small rear wing in full carbon and exterior mirrors cover in carbon look. Sportec logos on the sides and front spoiler complete the setup. On the inside you will notice the ignition key is placed left of the steering wheel, the great ergonomics creating a good ‘working’ environment and contain more than a passing resemblance with the Boxster dash board. The cheaper plastics were a down fall in from the high quality we’ve experienced from other Porsches. It feels a bit cheap, which contradicts the quality leather being used and the excellent seats. Sportec added an aluminium pedal set and two-piece black floor mat set – made of soft velour each embossed with a white Sportec logo – to the interior. The speedometer with customers choice color and Sportec logo was not build into the test vehicle, although it is an option for customer’s specing their own vehicle. Sportec-aluminium wheels in design Mono/10 are available in sizes 8.5J x 19″ (front) and 10J x 19″ (back). Each size is available in three variants; polished, aluminium or individual. The individual colors are blue, red and black. All wheels require a wheel adapter kit 2 x 7mm in the front and 2 x 20mm at the rear. Three wheel kits can be obtained including Michelin tyres 235/35 ZR19 in the front and 275/35 ZR19 at the rear. Twist the conventional key and the engine springs to life. A moderate idle sound is generated from the enhanced exhaust system. The system is used in the stage 2 kit on display and includes a new sport catalytic converter and headers. This system is only available for the stage 2 and stage 3 packages. Stage 1 only uses a new sport catalytic converter. A total of three stages are available for the Cayman S.
Performance stage 1 improves the Cayman S output to 232kW (315hp) at 6400rpm, a maximum torque of 365Nm at 4700rpm and includes a sport airfilter, ECU upgrade and exhaust system – as discussed above. 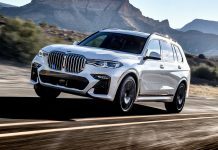 The second performance stage produces 279kW (380hp) at 6750rpm, a maximum torque of 425Nm at 4700rpm, incorporates an extra engine conversion to 3.8 liter and a performance clutch. Stage 3 only differs from stage 2 on the engine conversion up to 4.1 litre producing 298kW (405hp) at 7300rpm and a maximum torque of 420Nm at 6150rpm. All kits ensure a nice increase of performance. The Cayman SP 380 sprints from 0 to 100km/h in about 4,4 seconds, 0,9 seconds faster than the factory kit. Stage 3 kit is even 0,1 second faster. The top speed is 294km/h (183mph) and approximately 300km/h (186mph) for stage 3. An analysis of the figures gives a clear view on the options available. Our personal choice would be the stage 2, delivering a higher amount of torque at a lower amount of revs than stage 3. The speed difference nor the increased displacement doesn’t influence our choice. The full range of accessories doesn’t stop with just performance upgrades. 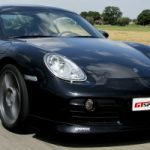 Sportec also offers a short shifter decreasing the shift length by 22%, springs lowering the Cayman to 35mm – also possible on vehicles with the Porsche Active Suspension Management – and a sway bar kit for front and rear axle increasing the suspension’s roll stiffness and resistance to roll in turns. The Sport brake system kit includes 350mm drilled steel brake discs with 6 piston calipers for each disc. You will be able to fit them on 18-inch or larger wheels. All these options were fitted to our test vehicle. The final driving characteristics of the Cayman have changed, but not dramatically. The short shifter improves the fluent transmission handling. The steering feedback and response are exemplary and show the high profile cornering characteristics of the suspension. The sway bar kit is a noticeable difference keeping the sports car perfectly stable. The power upgrade is what you expect and gives a decent kick in the back. 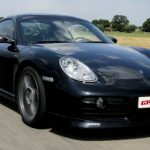 The standard moderate sound of the Cayman, a combination of exhaust, intake, and valve-train, is replaced by a higher snarling intake and exhaust sound. Although the difference isn’t noticeably higher inside the vehicle, outside you definitely experience an improved Porsche soundtrack.